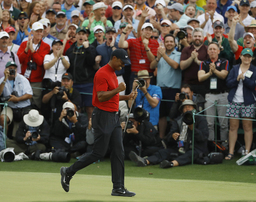 AUGUSTA, Ga. (AP) No comeback by Tiger Woods was ever going to be complete without a major. So much appeal of that red shirt beneath a green jacket involved looking back at all Woods had to overcome to reach that moment - a Masters champion once again - that so many thought would never happen. That's why Woods celebrated his 15th major like never before - fist pumps without a club in his hand, because he couldn't help himself walking off the 18th green. He went 28 majors over 11 years without winning, and no sooner did he stretch his arms into that familiar green jacket - "Ah, it fits," he said in Butler Cabin - was he asked about the 18 majors Jack Nicklaus won to set the gold standard in golf. So, imagine the effect of winning the Masters, especially the way this one played out. Six players had at least a share of the lead at one point on the back nine - four of them major champions - and there was a five-way tie for the lead when the final group was in the 15th fairway. And then it became Woods' game - a two-putt birdie to take the lead, an 8-iron that rolled down the slope next to the hole for a signature moment at this Masters. As dynamic as this Masters was for Woods, it was hard work and he needed help - from Molinari on the 12th and 15th holes, from a couple of good bounces out of the trees. That's not unusual. Every major champion needs a break or two. "We're on 14 and I said, `Let's get to 15.' You can't be on 14 and thinking about 18," LaCava said. "But now we can start talking about 16. So we're getting closer."